Conveyors, Pulleys, Belting, and Much More. You need it? We’ve got it. To minimize your down time, Belt Tech Industrial maintains an extensive inventory of in-stock items, including thousands of feet of multiple specifications of conveyor belting, over 200 pulleys from SUPERIOR® Industries, shafting (from 1 7/16″ to 10″), power transmission items, plus numerous brands and sizes of bearings. Even non-stock items can be shipped to you within 1-2 business days. 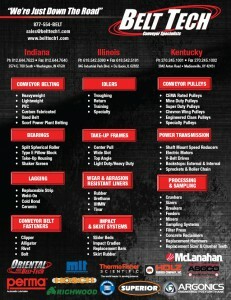 For all parts of your conveyor belt system, Belt Tech is your one stop supplier. Please download our Line Card for our complete product line.